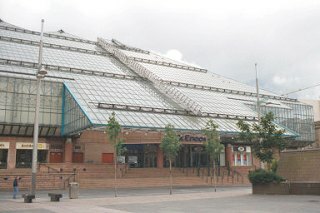 Located on the site of the former St. Enoch Railway Station, between the River Clyde and Argyle Street, the St. Enoch Centre is the largest glass covered shopping centre in Europe. Opened in 1990 by Prime Minister Margaret Thatcher, the centre contains more than 80 shops over two floors, parking spaces for several thousand cars and Scotland's largest food court. There was also an ice rink, which closed in 1995. In total, the centre represents 65,030 sq. m (700,000 sq. feet) of retail space. Buchanan Street lies to the north. Designed by GMW Architects, the centre was built by Sir Robert McAlpine for a partnership of the Church of England Commissioners and Sears Properties Limited, who sold the centre to a German pension fund in 1996 for £160 million. Two major refurbishments have taken place in 1998 and in 2005-09. In 2010 a branch of the long-established toy store Hamleys opened here, the first outside London. St. Enoch Railway Station opened next to St. Enoch Square in 1876 and St. Enoch Hotel followed three years later. This hotel was the city's largest, with more than 200 bedrooms and the first building in Glasgow to have electric lighting. St. Enoch Station was the headquarters of the the Glasgow and South Western Railway and, with twelve platforms, provided services throughout SW Scotland, and on into England in partnership with the Midland Railway. Queen Victoria arrived here in 1888 on her way to visit the International Exhibition in Kelvingrove Park. The station closed in 1966, a victim of the Beeching rationalisation of the railways in Britain, and remaining services were diverted to Glasgow Central station. Both hotel and station were demolished in 1977 and the fine red sandstone rubble was used to infill the Queen's Dock, now the site of the Scottish Exhibition and Conference Centre. The immense station clock was moved to Cumbernauld Town Centre. The site was used as a car park until 1985 when work began on St. Enoch Centre.